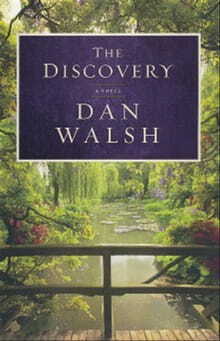 Even one new story from award-winning author Dan Walsh is a good thing—and in The Discovery, he’s given us two stories in one. The first introduces us to Michael and his wife, Jenn. They’re a cute couple (you can just tell), not long married and madly in love. As their story begins, Michael’s grandfather, a reclusive, wildly successful author, has just died—leaving Michael a small fortune and his historic Charleston house. Now the young folks have enough money so they can both quit their jobs while Michael pursues a writing career of his own. So far, so good. Then Michael’s sister Marilyn insists on stirring up trouble at the reading of the will. It’s not the bequest that bothers her, but a puzzling lack of information. Marilyn has been working on a genealogy project and it appears their family tree has no roots. There’s just no information to be found about their grandparents’ forebears or even their early lives. No photos, no marriage certificate, nada. Aha! A mystery . . . and then, a clue. When Michael and Jenn move into their sumptuous new digs, he finds a never-been-published manuscript hidden in his grandfather’s old typewriter case. Enter story number two: a World War II era romance. Wait. A romance? Michael’s grandfather, best-selling, Pulitzer-Prize-winning author that he was, didn’t write romances (except, apparently, for this one). The plot thickens. With the only surviving copy of a manuscript potentially worth millions in his hands, Michael settles down to read his grandfather’s book . . . and so do we. This second story is the tale of Ben Coleman. He just moved to Daytona Beach, Florida a couple of months earlier but has already fallen for the lovely and charming Claire. Unfortunately for him, Claire promised to wait for her high school sweetheart, who’s off fighting in North Africa. But that’s not Ben’s worst problem, not by a long shot. Ben is a man with a secret—and in wartime, secrets like his can get a man killed. It seems no matter which way he turns, Ben finds himself facing a moral dilemma. Now, as the two stories come together, you’ll probably see where everything is heading long before you arrive, but it’s a scenic trip so just settle back and enjoy the ride. Walsh is a gifted storyteller who is better than most at bringing another time and place to life. He really captures the feeling of America at war and the law enforcement excesses of the J. Edgar Hoover era. In addition, Walsh has a knack for making all his characters come to life, no matter when their story is set. One can imagine running into Michael and Jenn at church or the grocery store. We get to see Ben and Claire’s relationship from both their perspectives and both ring true; their romance is sweet without being sappy. Meanwhile, the war story is not only exciting; it really makes the reader wonder how they would respond in a similar situation. This combination of love and espionage makes The Discovery that rare find: a novel with appeal for male and female readers alike.